I like the idea of finding ways to reduce the amount of single-use anything I use each day, with the hope of not contributing to our already overburdened landfill destination. Not only does it take a lot of energy (human and fossil fuels etc.) to transport our garbage to landfill but also an enormous amount of resources to maintain landfills; in some places for as long as thirty years. New landfills collect the global warming greenhouse gasses: methane and carbon dioxide, that are produced from the slow decay of garbage with the intention of using them for industrial/energy purposes. Collecting those hazardous gasses is a big job, perhaps if we all did our part it could be a job that need not exist. Landfills are configured with special pipes that collect leachate*. If leachate seeps through liners, or from developing cracks, the leachate eventually finds its way into surrounding ground water, wet lands, rivers and lakes. Thus polluting the natural resources our entire ecosystem depends on. Did you know that most old landfills did not prevent leachate from entering our environment? Knowing this is definitely depressing, but realizing that we CAN, at an individual level make a difference each day by not contributing to landfill is very uplifting! 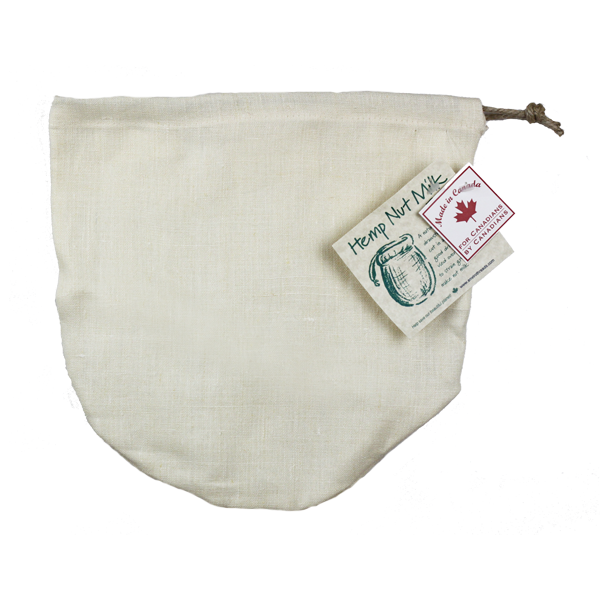 A simple reusable item is the Strainer-Bag or Nut-Milk Bag. I have a few which I dedicate to certain jobs in the kitchen. I don’t always use the strainer-bag every time I make stocks, and on those occasions, I will simply run the stock through a very fine wire mesh sieve. The strainer-bag/ nut-milk bag ensures a very clear stock. I don’t use plastic strainers/ sieves or nylon bags because I don’t like the idea of the food I am eating to be in contact with those substances. If I am to bother going the distance to prepare organic homemade food, milks and stocks, I think it is wise to consider the quality of the utensils and cookware used in preparing the food as well. I also don’t like the idea of using paper-based products to strain my stocks, because there is a lot of chemicals that are associated with paper products, besides the fact that they are a single-use product. Envirothreads is a Canadian company based in Lindsay, Ontario. They make their products from various cotton textiles including certified organic cotton, unbleached and printed cottons, hemp as well as bags made from post consumer polyester (made from recycled plastic bottles). Filmed between Spring and Summer of 2011, “Unwasted” is a look at businesses and organizations in and around the Puget Sound who are leading the way toward a less wasteful, more profitable and environmentally sustainable society.